When it comes to furniture for kids, the popular attitude is that because they grow out of things so quickly, cheap and functional is best. We get that, but there’s something to be said for beautiful pieces that will last for generations, designed and handcrafted with care. When big box stores are churning out low-quality furniture destined for the landfill, it’s nice to know that artisans like Green Cathedral still exist. Green Cathedral makes striking, refreshingly unembellished furniture for grow-ups and children. It’s not often you see the words “Handcrafted in Noosa,” but that idyllic little tourist town is home to the genius behind Green Cathedral. It all started with the colourful Babanees stool and things took off from there. 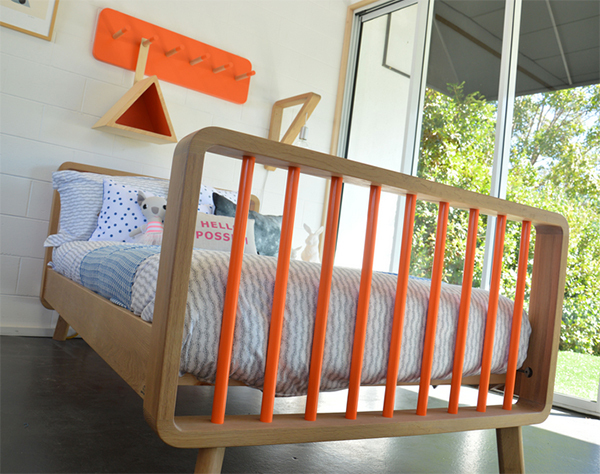 The Archie Bed (from $1590) is Green Cathedral’s first foray into the world of children’s bedroom furniture, and it’s designed with originality and a touch of courage. Each sleek, curved component is made from American Oak. The bars of the head and foot boards come in a choice of powder-coated aluminium or Tasmanian Oak that can be painted in one of hundreds of colours. When the lights go out, the paint glows in the dark. 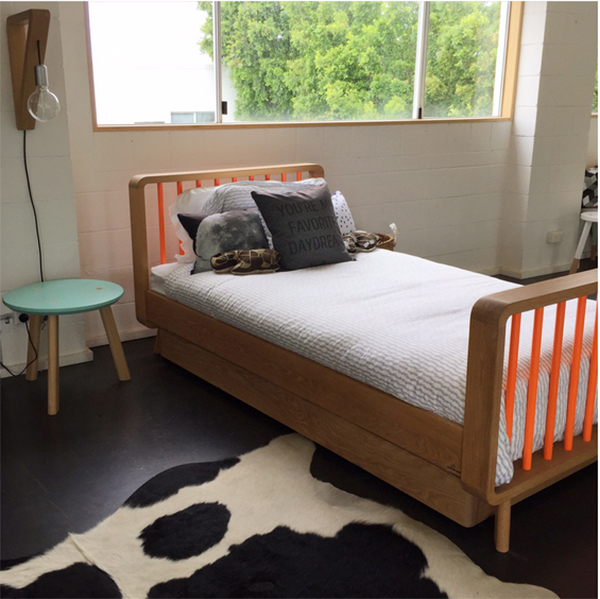 The Bella Bed (from $1450) is Archie’s sister: the same beautiful bed, but without the foot board. If you’re looking for a grown-up version, you’re in luck. The Bella and Archie come in all standard sizes, from single to king, with room for customisations. As with all exceptional things, furniture from Green Cathedral is not instant. Each piece is custom made, so lead times can be as much as eight weeks, which in our opinion is absolutely worth it. Shipping to Victoria, New South Wales and Queensland is included in the price. Get in touch for rates if you live in other parts of Australia.